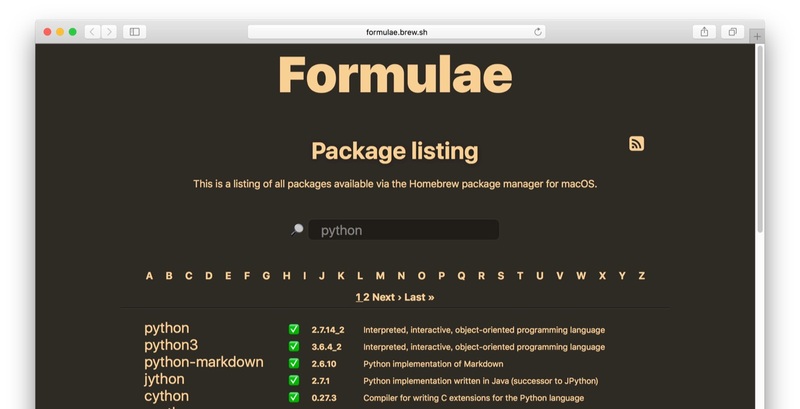 Mac用パッケージマネージャー「Homebrew」がv1.5へアップデート。3月1日にはpythonパッケージがPython 3.xへアップグレード。 | AAPL Ch. Today I’d like to announce Homebrew 1.5.0. The most significant changes since 1.4.0 are deprecations of formula APIs and some Homebrew organisation formula taps. On 1st March 2018 the python formula will be upgraded to Python 3.x and a python@2 formula will be added for installing Python 2.7 (although this will be keg-only so neither python nor python2 will be added to the PATH by default without a manual brew link –force). We will maintain python2, python3 and python@3 aliases.